Troy Howarth is the author of FAB Press’ award-winning book The Haunted World of Mario Bava. In addition to writing film and DVD reviews for the websites AV Maniacs and Eccentric Cinema, he is hard at work on his second book. He lives in Johnstown, Pennsylvania, and is getting married to his fiancée, Nicole, in October 2010. Not that Bava consciously set out to create “cult” movies...they just ended up being embraced in that manner. While much has been done in recent years to rehabilitate Bava’s image as a director of stylish but empty genre films, much remains in the way of accepting him into the canon of great filmmakers. Theorists and critics can argue among themselves over this point. But, to me, the solution is simple: watch the films. Some of his pictures are accepted as classics - Black Sunday (1960), Black Sabbath (1963), Kill, Baby… Kill! (1966) - but some are inevitably considered to be lower tier. 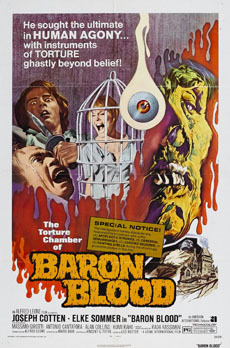 Among his less respected titles, one that remains vividly etched in my mind is Baron Blood (1972). It is unquestionably a lesser film for its director. It’s not especially original, and it’s hamstrung by a script that has one foot planted in the past and the other tentatively groping for the present. It also has some directorial missteps that simply can’t be excused, including an unfortunate over-reliance on the zoom lens. Yet for all of that, it has a special place in my heart. I can’t recall specifically when I first saw Baron Blood. I know I was very young - it may have been as early as 1982 or ’83, when I would have been all of 5 or 6 years of age. Children don’t ask much out of movies. Long before I developed a set of “critical faculties,” it was enough to be entertained - and Baron Blood did that in spades. It also scared the bejesus out of me. But more importantly, it stayed with me in a way that any number of horror potboilers did not. There was something weird about the film. I couldn’t put my finger on it, but it just didn’t feel like the typical horror movie. 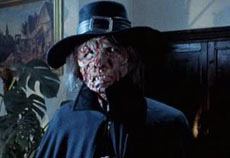 Some have suggested the movie is a good example of what Bava would have made had he accepted the offer to go to America to work for American International Pictures on a steady basis - or indeed, if he had been offered to come direct for Britain’s fright factory, Hammer Films. As observations go, that’s fair enough...but there’s an eye for atmosphere on display here that you just don’t get out of a lot of those films. The fact that Bava was allowed to shoot in a genuine castle in Vienna, Austria, surely accounts for a lot. But beyond that, there’s Bava’s flair for color, composition and camera movement. The story may be humdrum, but the direction transcends it. It’s precisely the kind of hokum that Antonio Margheriti, Bava’s so-called rival in Italy at that time, would have churned out to little discernible affect - just think of Margheriti’s Web of the Spider (1970), for example. No, Baron Blood doesn’t rank among the director’s masterpieces. Not even close. But, for all of its shortcomings - and lest I sound like a total apologist, I admit it: only he is responsible for that ghastly stream of zoom-in close-ups during the scene in which heroine Elke Sommer confronts the villainous Baron for the first time - Baron Blood is a good example of what made Bava so special. His influence goes beyond the genre. True, genre filmmakers like Lucio Fulci and Joe Dante have pointed to him as an influence. However, there’s also a long list of more “critically sanctioned” filmmakers who have embraced him as a personal favorite, from Tim Burton and Quentin Tarantino, to Martin Scorsese and William Friedkin. These guys know film as well as any stuffy academic, and they like him for all of the right reasons. I wish I could argue more eloquently on the film’s behalf as a great work of art, but I can’t delude myself. Baron Blood simply isn’t that good. What it is, however, is grand entertainment - and it made me a Bava fan for life, so it’s pretty special in my book.